Our Price: $885.00 Free Shipping! High quality at a great value have made the 1100 NY series an industry standard and the bookcase of choice for volume installation. For years, the 1100 NY Series has served the need of Schools, Universities, Hospitals and Offices across the nation. The space saving 1100NY series, featuring an elegantly simple line is a bookcase that is a perfect blend of quality, styling and functionalism. Each case has a solid lumber basefront and 1/4" printed back. 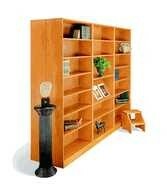 Shelves are constructed of 3/4" solid hardwood lumber with a 2" front edge, finished to a uniform color. 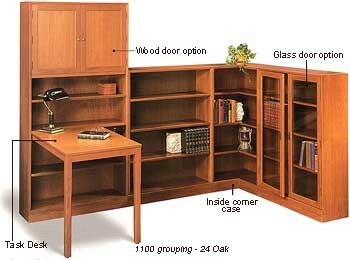 Includes FIVE adjustable shelves, and has a load-bearing weight of 150 pounds. Cases over 48" are shipped with one semi-permanent shelf. For your installation convenience, the 84" is equipped with heavy adjustable glides on the front corners and all cases allow for shelf adjustment at 1" intervals. Deep Storage: For the person with a need for more space we have the deep storage option for all the 1100 NY series bookcases. 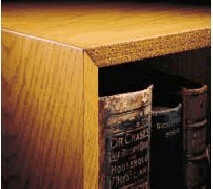 Shelf depth is 14 3/4" behind doors or 16 1/8" for the open case. Our Price: $495.00 Free Shipping! Our Price: $785.00 Free Shipping!